Written by webadmin on 30 January 2019 . Click to view the winning recipes this month for breakfast as lunch combinations. Written by Allison Jenkins on 30 January 2019 . 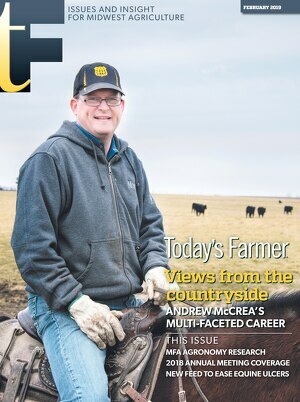 Whether telling stories or working cattle, Andrew McCrea balances a multi-faceted career. Everybody has a story. That’s what Andrew McCrea has discovered during his travels as an agricultural leader, speaker, broadcaster and author. McCrea, who serves on his local Agri Services board, was keynote speaker at MFA Incorporated’s 2018 annual meeting Nov. 27. His speaking career began when he was a state and national FFA officer. Since 1996, McCrea has produced “American Countryside,” a nationally syndicated radio program broadcast daily on more than 100 stations plus satellite radio. Even after 22 years and 5,000-plus shows, there’s an endless supply of ideas, he said. He may spend his time telling tales about others, but McCrea has quite an interesting story of his own. It’s one of leadership and entrepreneurship, natural-born talent and fierce family ties. The 46-year-old is not only an award-winning broadcaster, celebrated author and sought-after speaker but he’s also a fifth-generation farmer who balances his successful communications career with his cattle and row-crop farm near Maysville in northwest Missouri. The farm was established by McCrea’s great-great-grandfather in 1910. When McCrea was growing up, his father, M.L., and grandfather, Maurice, ran a renowned purebred Angus business and showed cattle all over the country. Maurice was also longtime beef cattle superintendent of the Missouri State Fair. McCrea figured farming would be his full-time career, too, but his involvement in FFA sent him on a life-changing journey. Terms as Missouri FFA president in 1991-92 and then national FFA secretary from 1993-94 required extensive travel, public appearances, leadership training and speaking opportunities—all skills that would serve McCrea well in his next chapter. With about half the farm’s 4,500 acres in pasture, there’s a lot of ground to cover when checking or working cattle. That’s why the McCreas usually round them up by horseback. They continually bring in stocker cattle at 400-500 pounds and market them at around 900 pounds.His FFA experiences also sparked an interest in broadcasting, even though he was majoring in general agriculture at the University of Missouri. His first radio gig was an internship with the Brownfield Network in Jefferson City during his senior year at Mizzou. When he graduated in May 1996, Brownfield offered him a full-time job. McCrea started his run with Brownfield in the fall of 1996, working in the studio three or four days a week, mainly doing the daily market reports. But he had something bigger in mind—a concept that had been brewing since his days as a national FFA officer. Station No. 1 was KFEQ in St. Joseph. Story No. 1 featured the president of the New Jersey Sweet Potato Association. U.S. Farm Report and can be seen on RFD-TV. This past summer, he also launched a Farm Journal podcast, “Farming the Countryside,” which exclusively features agricultural topics. McCrea said his speaking and broadcasting careers are inextricably entwined, a proverbial chicken-and-egg scenario. His interviews have also given McCrea material for several books, including “American Countryside,” “The Man Who Was President for a Day” and “God’s Perfect View.” His latest book, “Total Town Makeover,” came out in January and chronicles stories of small towns that have been revitalized by their citizens. No matter where he travels, however, McCrea is quick to say that home is his favorite place to be. In fact, he ends his on-stage presentations with a photo of the sign pointing the way to McCrea Farms, where he and his father keep up to 2,000 stocker cattle and raise row crops and pasture on 4,500 acres. McCrea and his wife, Paula, are raising the sixth generation on the farm with their children, Luke, 11, and Alison, 10. The majority of McCrea’s broadcasts are produced from his “home” studio, which allows him to be more available for his family. He’s also active in the agricultural industry and his local community, serving as past president of the Missouri Beef Industry Council and currently on the board of directors for MFA Agri Services in Maysville. Learn more about Andrew McCrea and his American Countryside broadcasts at americancountryside.com. You can also find his “Farming the Countryside” podcast at agweb.com. Click to follow American Coutryside on Facebook HERE. Written by Kerri Lotvin on 30 January 2019 . Weather extremes and marketplace challenges dominated discussions at MFA’s 2018 Annual Meeting, held Nov. 27 at the Holiday Inn Executive Center in Columbia. With so many outside forces at work—from economics and trade to regulations and technology—the meeting’s theme, “Empower Change,” was even more meaningful, said CEO Ernie Verslues. His president’s address outlined some of the ways MFA took charge of change in 2018 for the betterment of the cooperative and its farmer-owners. More than 600 delegates, employees and special guests attended the meeting, which featured exhibits by MFA’s operating divisions and MFA Oil. Even with weather and political issues affecting yield and prices, MFA managed to stay profitable, said Board Chairman Wayne Nichols. He specifically mentioned MFA’s efforts in helping farmers through the summer drought. Verslues listed other operational highlights of 2018, including cutting-edge livestock feeds, MFA’s PowerCalf app, a successful first full year at the Hamilton Rail Facility, MFA’s proprietary MorCorn and MorSoy brands of seed and industry-leading precision programs. He also reported that MFA is nearing completion of its MerchantAg software implementation at all company-owned stores, an upgrade that will provide better data access and management. The biggest change for MFA in recent months is the reorganization of the cooperative’s sales structure, resulting from the recommendations of a committee assembled from a cross-section of the company. What won’t change, he added, is MFA’s attention to people, finances, products, services and facilities. Financial highlights of MFA’s 2018 fiscal year, which ended Aug. 31, were shared by Chief Financial Officer Jeff Raetz. Consolidated sales reached $1.76 billion, which includes volume from MFA’s business entities and joint ventures. In 2018, MFA Incorporated’s cooperative business reached $1.05 billion in sales. MFA Enterprises, a wholly owned subsidiary of MFA Incorporated, had $195 million in sales. Formed in 2001, MFA Enterprises represents non-cooperative expansion in southern Iowa, southeast Kansas, west-central Missouri and northwest Missouri. Northwest Missouri Grain, also known as the MFA Rail Facility, reached $58 million this year. This joint venture with MFA Oil Co. opened in the summer of 2017. Other joint ventures include AGRIServices of Brunswick, Cache River Valley Seed, Mid-State Seed and Alliance Animal Care. MFA holds a 50-percent ownership in these companies. The cooperative also has 45-percent stake in Central Missouri AGRIService. Together, the joint ventures delivered $462 million in sales this year. Pre-tax profits were $8.3 million, and MFA will return $5.1 million to member-owners in cash patronage and equity retirements. While it was a “respectable profit year,” Raetz said, those figures aren’t ultimately where MFA needs to be. He attributed both the summer drought and harvest rains for the less-than-expected financial performance. Reviewing financial performance by category, Raetz reported that grain sales were $519 million, an increase of $37 million, with 84 million bushels handled throughout the system. Anticipating lower yields from this past season, he said the 2019 plan forecasts just over 70 million bushels. Field crop sales—which includes plant foods, seed and crop protection—were $613 million, an increase of $31 million over fiscal 2017. Raetz attributed the increase to a “good year” for plant food sales, which increased $41 million. MFA’s MorSoy and MorCorn also continue to make up a larger portion of seed sales. The drought, however, negatively affected crop protection sales, which decreased $9 million. Livestock supply sales increased $15 million to a total of $173 million, which includes feed, animal health and farm supply sales. Total margins and operating revenues were $223 million, an increase of $4 million from fiscal 2017. Joint venture earnings were $2.3 million compared to $3 million last year. Working capital was $83 million at year end. Total assets at the end of August were up slightly to $496 million, due mainly to an increase in supply inventory. Again, Raetz pointed out, this was a byproduct of lower sales volume during the summer. Raetz reported that MFA Incorporated has long-term debt of $84 million, including a term loan with CoBank, which financed the rail project, and the MFA Bond Program, which is unsecured debt. Total net worth increased to $165 million, divided into non-cooperative earnings at $112 million and member equities of $53 million. Addressing the challenges of 2018 has also been a focus for the Missouri Department of Agriculture. Speaking at the annual meeting, Missouri Director of Agriculture Chris Chinn gave an update on the department’s “MORE” campaign, which she said addressed food insecurity, rural access to high-speed internet, government regulation and workforce development over the past year. A gifted storyteller, McCrea shared his experiences both on the farm and on the air, describing interesting places and people he’s met along the way. His overall message focused on the meeting theme, “Empower Change,” emphasizing that there’s a huge difference between change that is done to us and change we are empowered to make ourselves. Reflecting on the many interviews he’d conducted through the years, McCrea said those who prosper in times of change have three traits that set them apart: They are personal and purposeful, and they have perspective. And people, Chairman Nichols said, will continue to drive successful change for MFA.